If you think Cancun is just about the beaches, think again! Some of the most challenging and enjoyable golf courses in the world are located in Cancun and the Riviera May on nature’s finest greens. 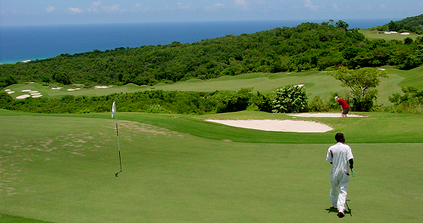 The tropical fairways of the Mexico Caribbean have natural curves and hills that enhance strategic course design. A golfer’s paradise, some of these dynamic courses include spectacular views of the Caribbean Sea, lush green vegetation, natural wildlife, and ancient Mayan ruins. The flourishing landscape and warm, sunny climate have drawn golf enthusiasts to the region, many of whom are golf professionals and course designers with an eye for developing some of the best golf courses worldwide. Over the years, famous golfers have selected the Cancun and Riviera Maya areas to lend their name to beautiful and competitive golf courses. Although there are many outstanding golf courses in the Mexico Caribbean, these are some favorites. Cancun Golf Club at Pok-ta-Pok – This competitive golf course gets high marks from tourists, professionals, and locals alike. Designed by Robert Trent Jones, Jr. in 1976, it is an 18-hole golf course, par 72, and 6,636 yards long, aesthetically developed around Mayan ruins, and with captivating views of Nichupte Lagoon and the Caribbean Sea. The course is located in the Cancun hotel zone on the lagoon side of Kukulcan Boulevard. If you plan to spend time here, consider staying at the course-adjacent Laguna Suites Golf + Spa hotel. Moon Spa & Golf Club – This strategically designed golf course was developed with environmental preservation in mind, incorporating the existing tropical landscape and natural animal habitats, and using native paspalum grass on fairways and greens. Designed by Jack Nicklaus in 2003, it is his only signature golf course in Cancun, and consists of three 9-hole courses – Jungle, Lakes, Dunes – each a par of 36 with 10,798 combined yards. The course is located off Carretera (highway) Cancun-Chetumal at Km. 340. Playacar Spa & Golf Club – This magnificent championship golf course is surrounded by multiple lakes and verdant vegetation, and is touted as the most challenging golf course in the area. Designed by the renowned American architect, Robert Von Hagge in 1994, this acclaimed golf course consists of 18 holes, par 72, measuring 7,144 total yards. The course is located in Playacar Phase II, an exclusive residential community in Playa del Carmen (Riviera Maya). Playa Mujeres Golf Club – This top 10 Mexican golf course is recognized for its conscientious environmental development and by the Executive Women’s Golf Association (EWG). Designed by the famous golfer, Greg Norman in 2006, it is an 18-hole golf course, par 72, and 7,260 yards long. One of the best courses in the area, it boasts white sand traps with water holes and bunkers strategically designed around native tropical jungles and animal habitats. It includes stunning views of the Caribbean Sea and Isla Mujeres. The course is located north of Cancun on Bonampak Avenue towards Punta Sam. 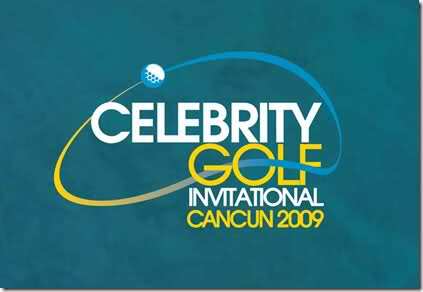 The 2009 Celebrity Golf Invitational tournament is being held at Playa Mujeres Golf Club. The three-day event takes place from December 3rd through December 6th, 2009, with such celebrities in attendance as the 1968 Mexico Olympics winner and long jump record breaker, Bob Beamon; and former professional basketball players Rick Barry, Sam Jones, and John Starks. The celebrities will be staying at the endless luxury, all inclusive Hacienda Tres Ríos Resort, Spa & Nature Park in the Riviera Maya where a special memorabilia silent auction and celebrity charity poker tournament will take place.